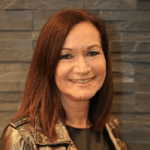 Professor Carolyn Mair is a Chartered Psychologist and Fellow of the British Psychological Society based at the London College of Fashion, University of the Arts London where she is Professor of Psychology for Fashion. She graduated from Bournemouth University with a BSc (Hons) in Applied Psychology and Computing, gained the MSc Research Methods from University of Portsmouth and was awarded a PhD in Cognitive Neuroscience from Bournemouth University. Carolyn has worked in Higher Education since 1998 where she has led on multidisciplinary research projects, taught students at all levels and supervised doctoral students. At London College of Fashion, she developed the world’s first master’s and undergraduate courses to apply psychology in the context of fashion. The MSc Applied Psychology in Fashion was awarded the British Psychological Society’s 2016 Innovative Programme Award. Prior to this, she worked as a visual merchandiser, graphic designer, dress maker and portrait artist. Carolyn’s research is multidisciplinary focusing upon understanding and supporting the development of well-being and resilience across the broad context of the fashion industries. She is also interested in enhancing students’ engagement and performance through the application of psychological science. Carolyn serves on the editorial boards of Psychreg Journal of Psychology and Modapalavra. You can follow Carolyn on Twitter @Carolyn_UK and on her blog.